Canon Pixma MG3220: The control panel is quite basic, making it simple to figure out and use. Basic—that word best describes Canon Pixma MG3220. At 17.7 inches wide by 12 inches deep by 6 inches high and weighing only 12.1 pounds, it&apos;s compact and light—you can put it just about anywhere, even under low-hanging shelves and cabinets. As mentioned, though, it lacks slots for memory devices, so you can&apos;t print directly from the device itself. That requires a PC, or you can print (and scan) directly from Android and iOS (iPhones, iPads, and iPods) mobile devices with Canon&apos;s free Easy-PhotoPrint app. In addition, unlike the MG3120 that preceded it, the MG3220 supports Apple&apos;s AirPrint. You can, however, copy and scan straight from the logically laid out and easy-to-use control panel, which consists of eight simple buttons and a single-line monochrome LED screen. Note that because memory devices like USB sticks are not supported by this printer, scans you initiate from the control panel are printed, rather than saved. When the MG3220 is connected directly to a computer via a USB printer cable, you can push scans from it to your PC, but this function doesn&apos;t work over a wireless connection. The real question here, though, is, how does this model differ from its last-generation predecessor? The answer is, alas, not much. In addition to the AirPrint support we just mentioned, Canon has included a new application, entitled My Image Garden, on the installation CD, as well as a Facebook app named Print Your Days, which you can find at, well, Facebook. Overall, My Image Garden is just another photo-indexing program for sorting, displaying, and printing the images stored on your computer. What&apos;s worth noting about this one, though, is that it has a face-recognition feature for finding and indexing the people in your photos. During our tests of My Image Garden, we found this aspect of the program fairly accurate and convenient. Print Your Days, on the other hand, wasn&apos;t all that inspiring. This app, which uses Microsoft&apos;s Silverlight technology, lets you lay out and print photographs from Facebook pages and albums. You can include from one to five images in your layout, add captions, and perform other basic edits. Some avid Facebook users might find this app useful, but we didn&apos;t see it as a make-or-break selling point. Although the Pixma MG3220 supports Wi-Fi, getting it connected to your wireless network isn&apos;t as straightforward as on some other AIOs, most of which provide easy-to-follow wizards that discover your wireless router and walk you through making the network connection. Connecting to this model, though, can be easy or a bit of a chore, depending primarily on whether your router supports Wi-Fi Protected Setup (WPS). In either case—with WPS or without—you&apos;ll need to launch the installation program on the included CD. With WPS, the installation software steps you through connecting to the network by pressing a few buttons on the printer&apos;s control panel and verifying symbols on the LED. Without WPS, however, you&apos;ll have to connect the printer to a PC via a USB printer cable and allow the setup program to configure the wireless connection. The good news, at least, is that a USB printer cable is included. (That&apos;s never a given.) If you don&apos;t need a wireless connection to the printer, you can use the USB cable to connect it directly to your PC. Once you get the printer connected to your network, though, the rest of the setup process—installing the ink cartridges and loading the paper tray—is simple. The two cartridges are one large black-ink tank, and a three-ink tank containing cyan, magenta, and yellow. 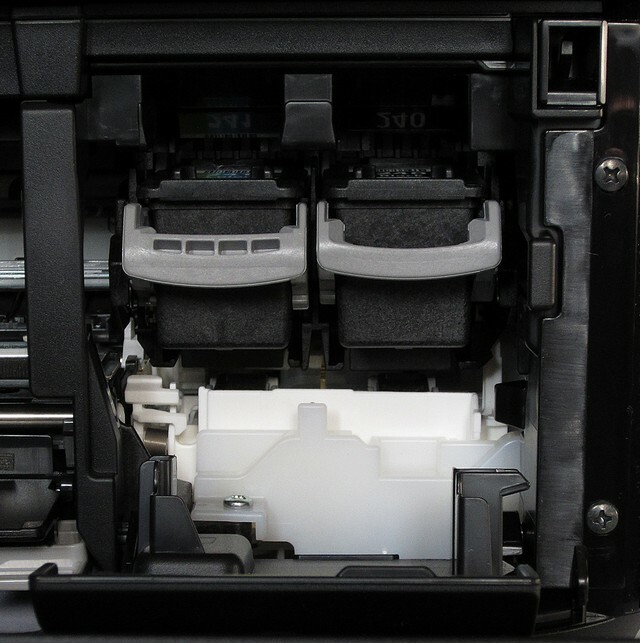 As shown in the image below, you load the cartridges into a small compartment on the front-right corner of the chassis. While setting up the MG3220 may not be as easy as it should be, printing with it is. Like most Pixmas in this price range, the MG3220 has only one 100-sheet input tray, which folds out at the bottom of the device. The output tray folds down over the input tray. This straightforward design is common on several low-cost models, not just Pixmas, and it typically provides hassle-free printing. During our hands-on time with the MG3220, we printed a bunch of test pages using various media, including two-sided pages, envelopes, and various sizes of photographs, without incident. As expected on any modern inkjet, the paper track on the MG3220 was sound and dependable. AIOs dubbed "photo printers" should, we think, produce superior photographs, and quickly—especially when you&apos;re talking about snapshot-size (4x6 inch) prints like the ones on our Photo Printing Test. Typically, Canon&apos;s Pixma MG models ("MG" is Canon&apos;s designation for its photo-centric AIO printers) print the most vibrant and detailed images we&apos;ve seen. However, here we&apos;re talking about the company&apos;s models that use five or six ink tanks, such as the Pixma MG5320 (five ink cartridges) and the Pixma MG6220 (six ink cartridges). 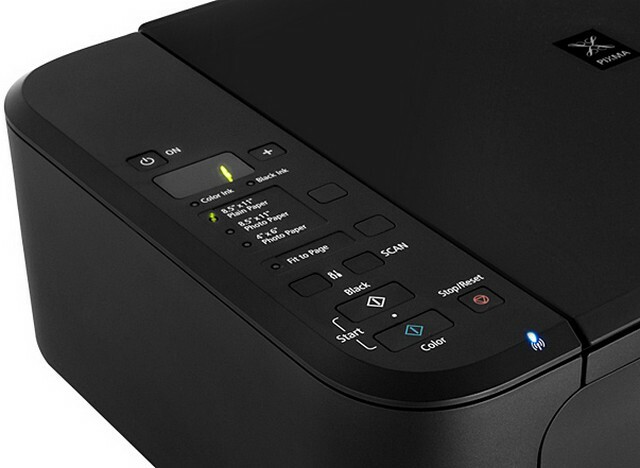 The MG3220&apos;s business-document output looked quite good, but if you&apos;re looking for a business-centric printer, plenty of better-suited models are available, including a few in Canon&apos;s Pixma "MX" office printer line. Unfortunately, though, many of the Pixma MX models use the same two-cartridge ink system as the MG3220 and, therefore, deliver the same too-high cost per page. Copy quality was also respectable, with our copies of our all-text and mixed text-and-graphics test documents looking very close in quality to the originals. In addition, photos copied well and were hard to distinguish from the originals, unless you compared them closely, side-by-side. Even the best AIO copiers don&apos;t reproduce photographs perfectly, so kudos to Canon for managing this in a $79 AIO. Keep in mind, though, that the MG3220 lacks an automatic document feeder (ADF), which will make scanning and copying multipage documents time-consuming. You must feed originals to the scanner bed one at a time. We know we sound like a broken record on this issue. (Perhaps, today, we should update that hoary old simile to "scratched DVD," if only they skipped reliably?) But as we&apos;ve said about several entry-level Pixmas, this one&apos;s CPP is much too high. It&apos;s so high, in fact, that what you pay per-page for ink, even if you use the MG3220 infrequently, negates the savings you might gain from the original purchase price. For example, when you use Canon&apos;s so-called "XL" black tank and "XL" color cartridge, monochrome (black-and-white) pages will run you about 7 cents per page, and each color print costs about 14.5 cents per page. A year or two ago, these CPPs might have been competitive, but nowadays several printer makers offer entry-level models with much lower per-page operational costs. Case in point is Kodak&apos;s ESP 3.2, which delivers monochrome pages for about 3.8 cents and color for 10.1 cents, when you use that printer&apos;s lower-yield cartridges. Canon does provide some—but not much—relief, when you purchase its "XXL" black cartridges. With these, black-and-white pages drop to about 6.3 cents and color prints cost about 13.3 cents. Still, these CPPs are higher than several competing models. (Canon doesn&apos;t offer an XXL color-ink cartridge; hence, the slim reduction in the color-page costs.) On the other hand, when you use Kodak&apos;s highest-yield cartridges with the ESP 3.2, black-and-white pages drop to about 3 cents each, and color pages run about 9.5 cents. It doesn&apos;t take a mathematician to understand that, with these per-page cost differences, a printer like the ESP 3.2 can save you a lot of money over time. Canon has gotten a lot of mileage out of the print engine in the MG3220. In our opinion, though, unless the company can find a way to make it faster and more economical to use, it&apos;s time to update it. In terms of print speeds and cost per page, too many competing models can outdo this Pixma. Print quality, ease of use, and reliability can carry an AIO only so far—especially considering that these are not attributes exclusive to Pixmas. Several companies make good-quality, entry-level inkjet AIOs. As we said about the Pixma MG4220 recently, we&apos;d feel much better about recommending this Pixma if it just didn&apos;t cost so much to use. In addition, if keeper photographs are your primary motivation for buying a new printer, the slightly higher-priced Pixmas would serve you better.